We’re obsessed with the ocean. Though we’ve only lived one year out of our 28 near the ocean but we know we’ll end up there finally…. In a cottage or on a sailing boat. Who knows. But the ocean is calling and we must go. So do we. Each year we return to the ocean and this obsession only grows. Listening to the music of the waves while feeling the salty breeze on my face is the best meditation I can imagine. The ocean amazes me. It’s restless, tameless, whimsical, powerful and beautiful. Calm and pretty on some days and dangerous on others. Never boring. We like swimming in the ocean, walking on its endless beaches, watching as the last rays of the sun turn the waves into red and gold. Simply being there. Oh, and hiking there! We love hiking mostly anywhere, of course, the ocean coast is no exception. What spectacular views it can offer! Our favorite hike is probably the one we haven’t finished. 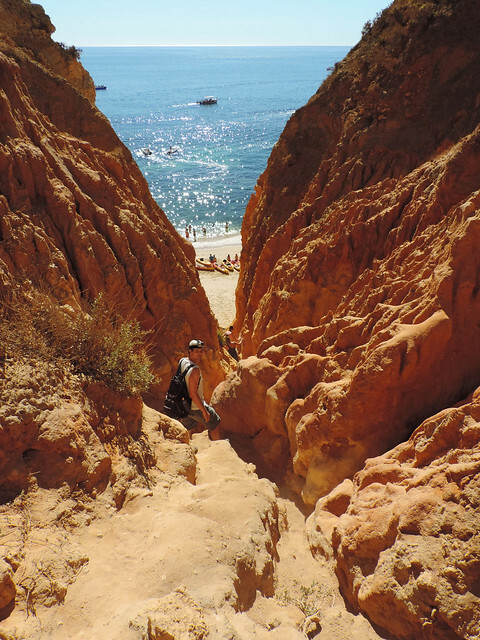 😛 The coastal walk called “Seven Hanging Valleys Walk” in Algarve is one of the most spectacular coastal hikes we’ve ever done! 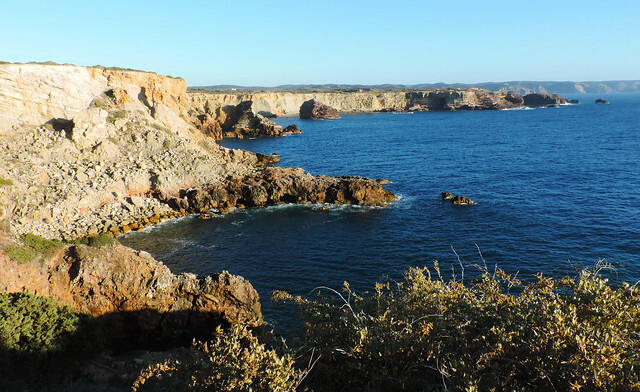 The trail runs on the top of the cliffs along the coastline and it offers views of uniquely shaped limestone rock formations, caves, arches and emerald green bays. Actually, those wonderful emerald green bays are beaches and most of them can be accessed from the trail. And that’s the exact reason we didn’t have time to finish this hike. 😀 We decided to turn back at sunset so that we can get back to our car until it gets completely dark. The trail can be started from both ends. 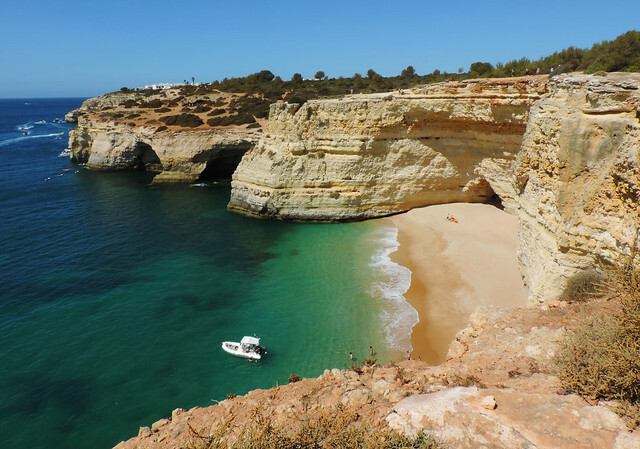 We started from Praia da Marinha that is one of our favorite beaches in Portugal. It’s worth spending a whole day just on this beach in our opinion, but it’s just a sidenote. 🙂 The next day you can actually start hiking and the trail starts with views of Praia da Marinha from above. A perfect start. The coast is intensely eroded and God knows how it will look like if you go back 20 years later. 2 mm – 2 metres land is lost to the sea yearly and the waves, the rain and the wind are constantly forming the limestone rocks. The result is breathtaking! Short, easy, scenic walk and plenty of pretty beaches at the same time? 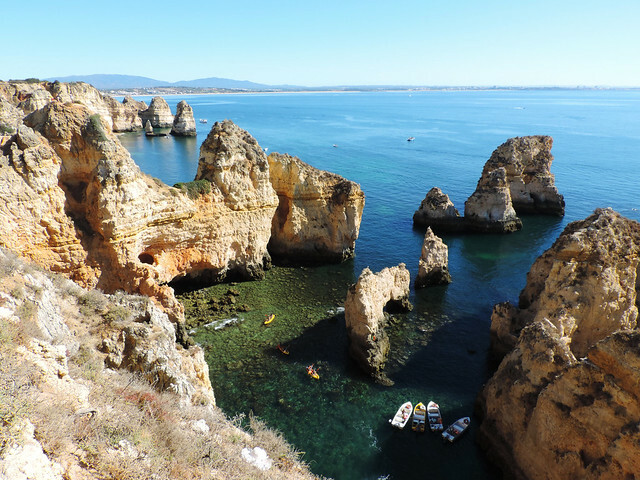 That’s what we found at Ponta da Piedade in Lagos. 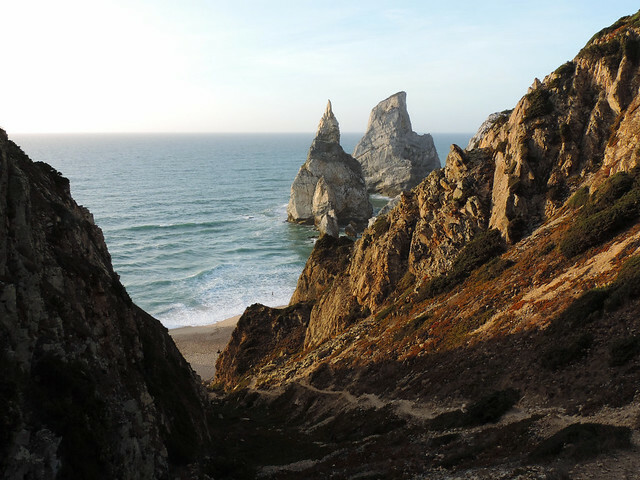 Ponta da Piedade is the name of the lighthouse and also of the group of rock formations along the coastline. 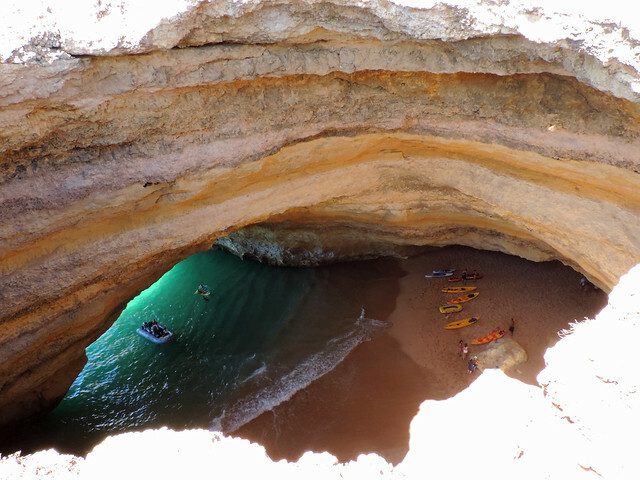 The yellow-orange cliffs, grottos, caves and small but very steep canyons are among the most famous sights in Algarve. 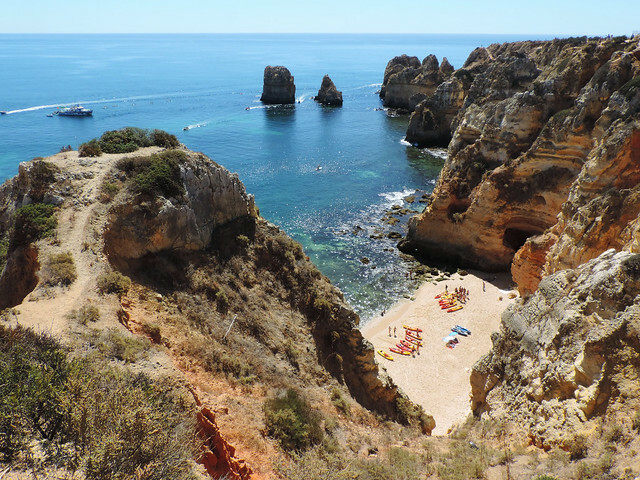 Several grottos can be visited by boat but there’s a trail from the lighthouse to Dona Ana Beach on top of the cliffs that rewards with stunning scenery. We found some smaller bays and beaches on the way and most of them can be accessed from the trail. We climbed down in a steep and very-very orange canyon to have a swim once. But Dona Ana and Camilo beaches can be accessed by stairs, too. It’s a short walk so we could spend plenty of time on the beaches. Still we did this walk once in the morning and once around sunset. It’s a spectacular sunset spot as the late afternoon sun makes the cliffs turn into gold. Algarve is a region famous for fabulous colors and rock formations but it’s not the only place to find special views in Portugal. 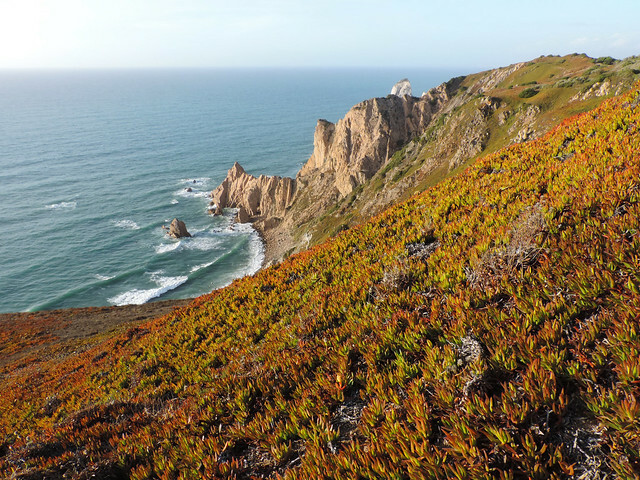 Our favorite hike in the Lisbon region starts from the lighthouse of Cabo da Roca. 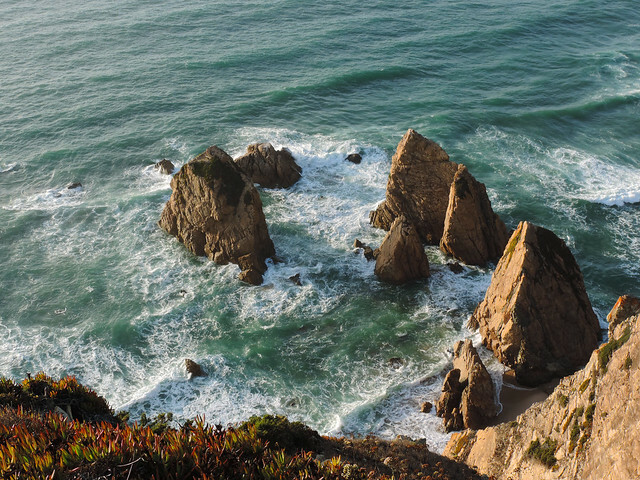 Cabo da Roca is the westernmost point of continental Europe – that already makes it special. Windy, too. Very windy. 😀 But the rugged, wild coastline with high cliffs and picturesque beaches amazed us in no time. 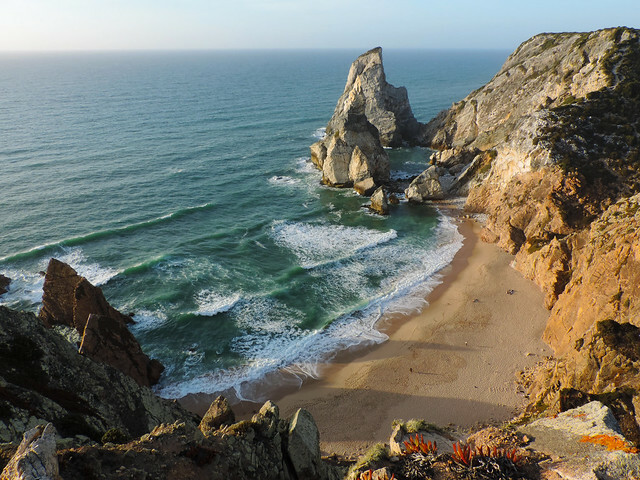 Actually, we couldn’t decide which direction to hike from Cabo da Roca so we did both. 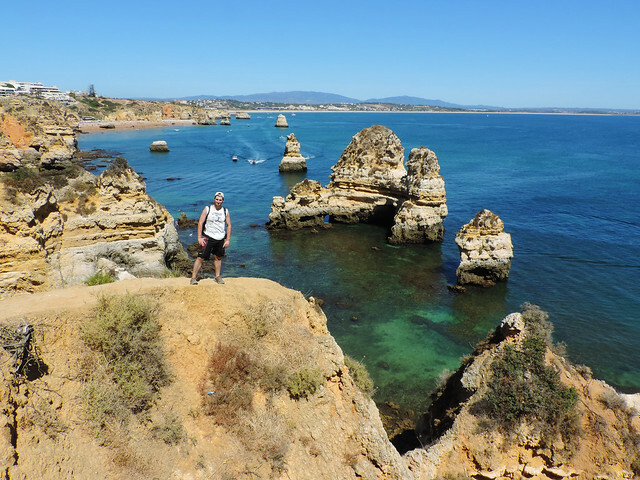 First, we did the short hike southwards to get a view of Praia do Louriçal (praia means beach in Portuguese). Then we hiked back to Cabo da Roca and headed north towards Praia da Ursa. We even hiked down to the beach and watched the sunset from there. 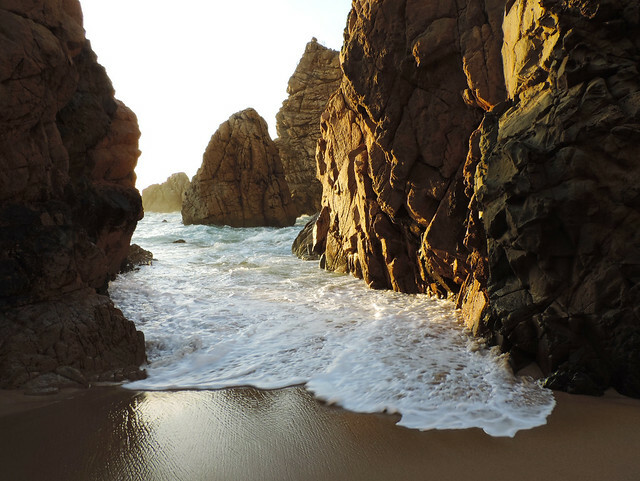 It’s the most amazing beach we’ve seen on the Western coastline! 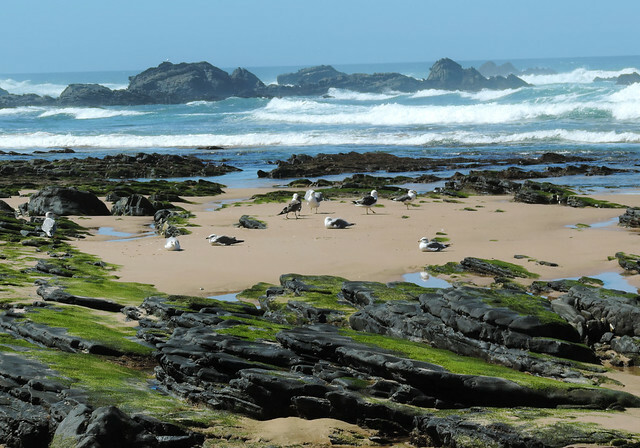 Praia da Amoreira and Praia da Carriagem are both beaches near Aljezur in the Alentejo region. But the Western coastline of Portugal mostly have windy surfing beaches so we didn’t plan for a traditional beach day. That would have involved bathing suits for sure, but we felt just fine in shorts and wind jackets. There’s a long trail along the coastline and we explored only a small portion of it: the section between Praia da Amoreira and Praia da Carriagem. On the way there we hiked on top of the cliffs, then we used the stairs to walk down to Praia da Carriagem. We walked back on the beach while observing the tide pools. 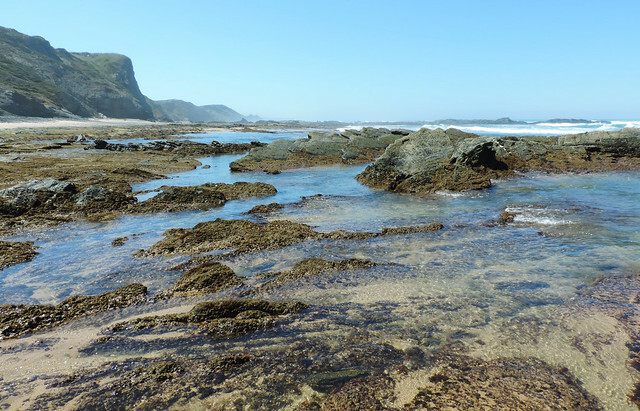 Tide pools are always fun, we learnt that in California… They are places to observe small fish, crabs and different kind of strange, colorful plants. 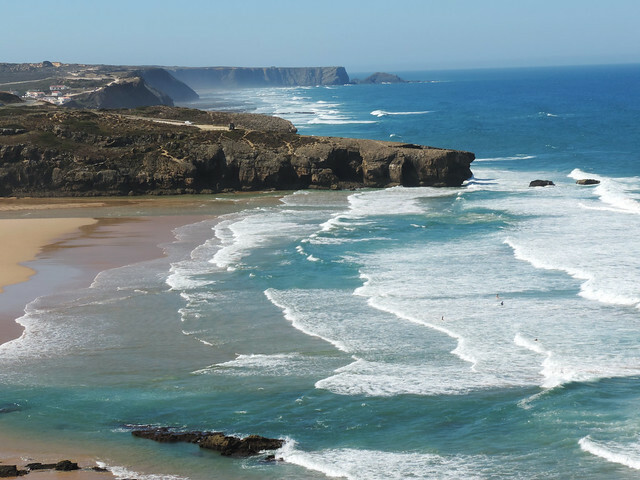 Praia da Bordeira is another windy surfing beach of the Western coastline. 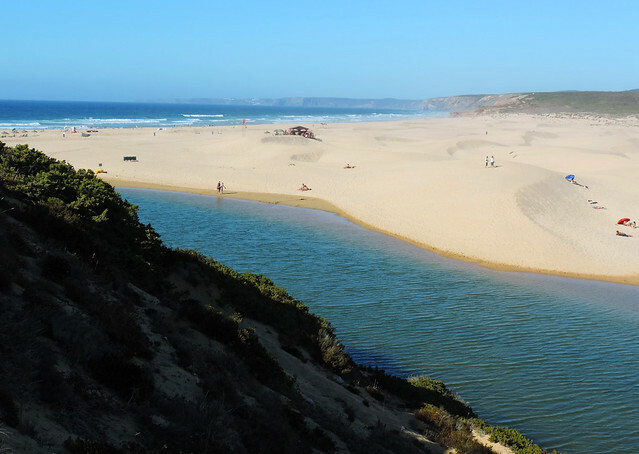 Carrapateira river reaches the ocean right next to the beach and the river protected by the sand dunes is an ideal place for children to play in the shallow water. But we didn’t stop there for long. We continued hiking up to the top of the cliffs. Finally, words of caution. Because the ocean is amazing but it can be dangerous, too, if you don’t respect it. 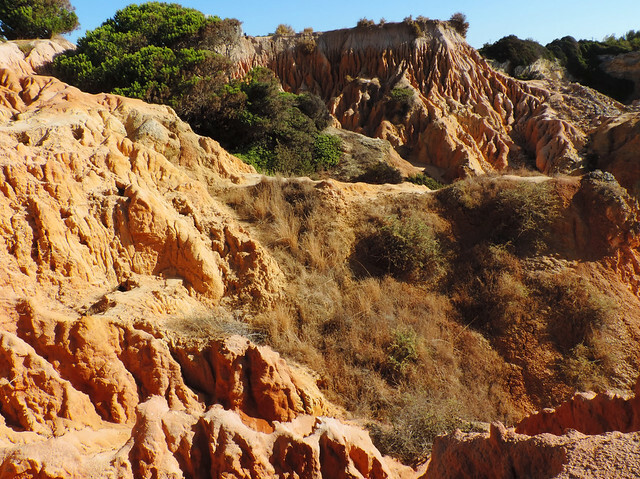 Never walk to the very edge of the cliffs – especially on these coastal trails. Cliffs are eroded at a lot of places and you usually don’t realize how thin and fragile the cliff edge is where you are standing on. If you’re caught in a current, don’t fight. Swim parallel to the shore and ask for help. Do you like coastal hikes? Which ones are your favorite? I love coastal hikes. 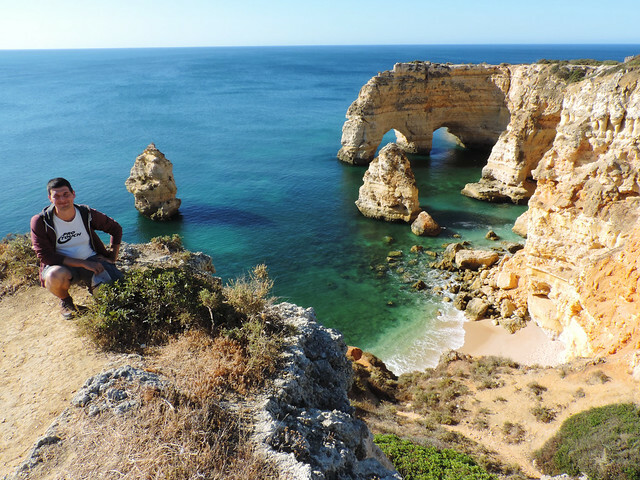 I’ve done the Lagos one a few years ago and I’m looking forward to returning to Portugal for more of these beautiful hikes. Oh, we miss the colors and the sunshine, we hope to return, too!